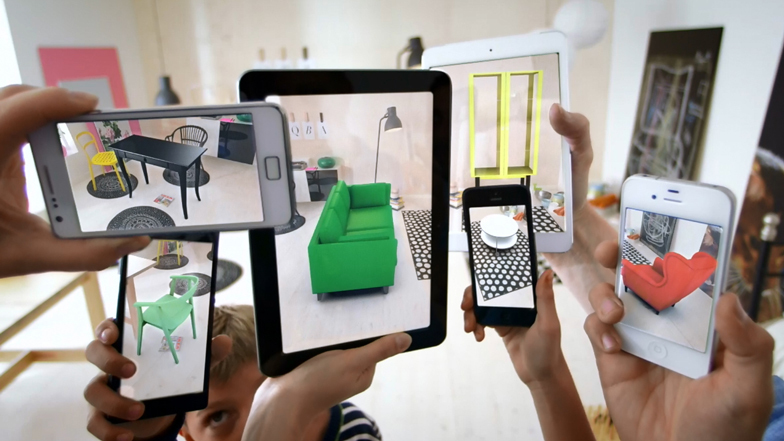 News: Swedish furniture retailer IKEA has added an augmented reality function to its 2014 catalogue, allowing customers to see what products will look like in their homes. The 2014 IKEA catalogue works with the IKEA app on a smartphone or tablet. Customers put the catalogue on the floor as a marker and can then select the product they want to see in that location via the app. The room is shown on-screen through the camera on the device and superimposed with the chosen object as though in-situ. The app currently features 90 products including sofas, chairs, desks, beds and bookcases. "Our customers want to be able to test out whether the products they’ve been inspired by in our catalogue will work in their own homes – particularly when it comes to larger pieces of furniture," said Peter Wright, country marketing manager of IKEA in the UK and Ireland. "Offering a way of using mobile technology to enable to test products means the technology has a practical purpose and really helps customers visualise the way their homes could look." The new app will launch in the Apple App Store and Google Play on 25 August 2013. Earlier this year we covered news about 3D technology company Inition who developed an augmented reality iPad app that allows architects to look inside static architectural models, visualise how their building will look at night and track how wind flows around their design proposals. Ikea will make its most extensive ever use of Augmented Reality (AR) when it launches its new mobile Catalogue this month. AR will be used to place its products into customers' rooms to enable them to find their perfect fit. The new app will launch in the Apple App Store and Google Play on 25 August 2013. The 2014 IKEA Catalogue app (available on iOS and Android) will enable customers to try out 90 products for size (and shape and colour and positioning) in their own homes. The app uses the catalogue itself to judge the approximate scale of the furnishings – measuring the size of the catalogue itself (laid on the floor) in the camera and creating an augmented reality image of the furnishings so it appears correctly in the room. Customers will be able to see what different IKEA sofas, chairs, beds, bookcases, chests of drawers and desks look like in their rooms virtually, simply by using their mobile phone camera. How the Augmented Reality features works: Customers can put the physical IKEA Catalogue into their room in the space where they want to test a product. The Ikea Catalogue App picks up the catalogue and uses it to gauge the correct scale for products that will be shown on-screen. The product then appears on the customer’s mobile phone camera within the Ikea Catalogue App so it can be tested for colour and size. Customers can then test different products to find the right one for their home – finding the perfect fit. IKEAs research has shown that many of its customers suffer from "Square peg, round hole syndrome" as 14% say they’ve bought the wrong-sized furniture for their rooms and over 70% say they don’t really know how big their own homes are. Making the most of the available space is particularly important in the UK because it has the smallest houses in Western Europe, with the average house having shrunk to as little as 85 square metres. Peter Wright, Country Marketing Manager, IKEA UK and Ireland said: "When our designers and interiors experts started to think about how we could use augmented reality to help our customers, we felt that we could solve some of the very real problems they face. Our customers want to be able to test out whether the products they've been inspired by in our catalogue will work in their own homes – particularly when it comes to larger pieces of furniture. Offering a way of using mobile technology to enable to test products means the technology has a practical purpose and really helps customers visualise the way their homes could look."